I decided to try Whole Body Cryotherapy every day for two weeks because I had bad back and shoulders pain due to my job. I am a Portfolio Manager so I spend several hours on my desk in front of the computer. I also suffer from a condition called hip impingement (when the ball and socket of the hip joint don't fit together properly). The constant pain in my hip made me quit on running and restricted a lot the kind of exercise I can do. I work at Warren Street so it only took me about 20 minutes to get to Liverpool Street Station, and LondonCryo is just around the corner. I went early in the morning, during lunchtime and at the end of the day before going home. I was scheduling it around my daily professional commitments. 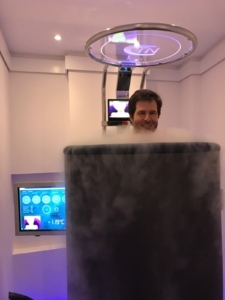 Maria from LondonCryo, where I did the sessions, asked me to give my testimony and write seven things I felt while doing Whole Body Cryotherapy Sessions every day for two weeks. Here it is Maria. Thank you so much for this experience. I strongly recommend it. 7 - I prefer to do it at the end of the day because I feel all the tiredness going away and I get home more relaxed.